Then Pendulum took to the stage for a live set. 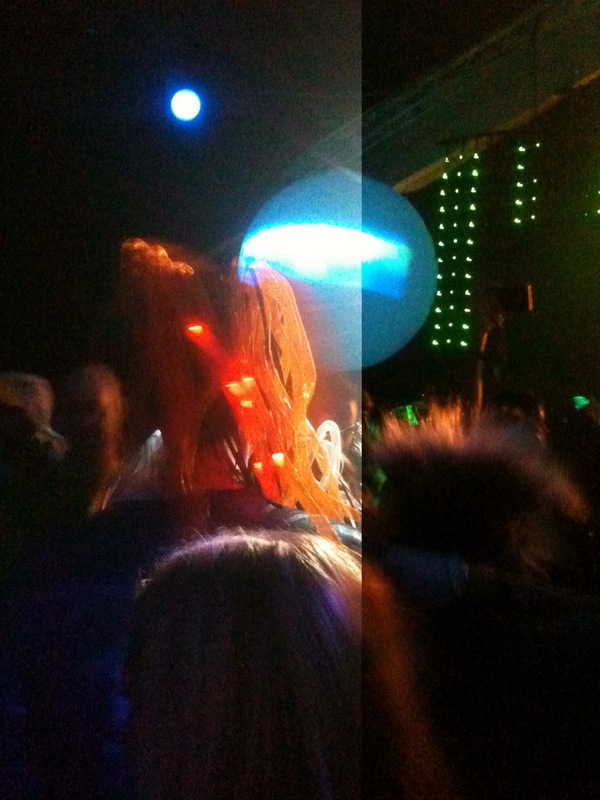 That was one of the highlights of any snowbombing I have ever been too, and the atmosphere was just amazing. If you have heard Pendulum before, like an album or something, believe me the live show is something completely different. Live Guitars, Live Drums, Live MC, and a good few thousand people just going for it. I think the temperature in the racket club must have been way up towards 40 degrees, especially by the time I had some Afro wig on and a part of a robot outfit which flew my way. That was glow in the dark dreadlocks. We also saw the stay puff marshmallow man, a lot of people in some skinmorph suit, a lot of thunderbirds, a good few robots, a skeleton head thing and a ton of people having fun. Magnetic Man, Proffessor Green tonight! If you want to get an idea of Pendulum live it goes down like this from last summer. Of course Friday night, Prodigy are playing!